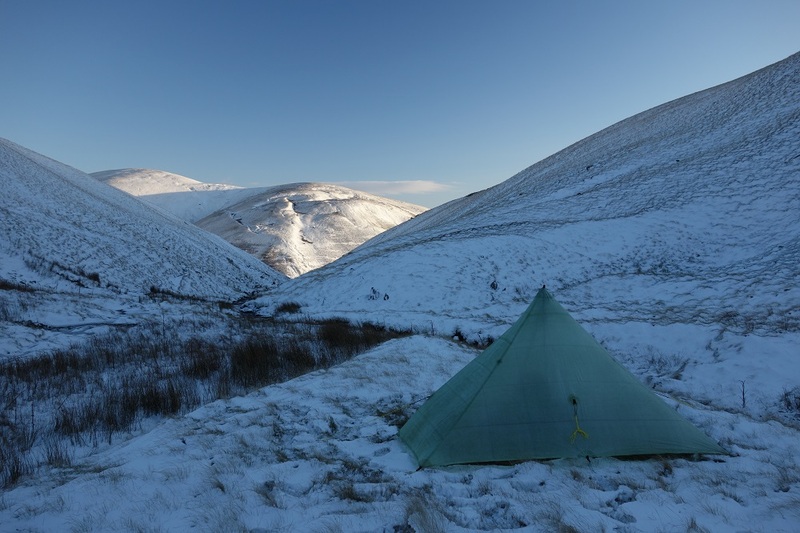 Bloke who really should know better ignores the impending weather forecast, pops up a hill for an overnight camp, and awakes to frozen essentials and a disintegrating tent. So yes, it has taken a couple of months to get around to writing up this particular little trek due to it being an embarrassing lapse into numptyness. One of those weekends when 40 years of hill skills deserted me and I was left wondering whether I’d be better off taking up something less prone to give me frostnip, like batik perhaps. 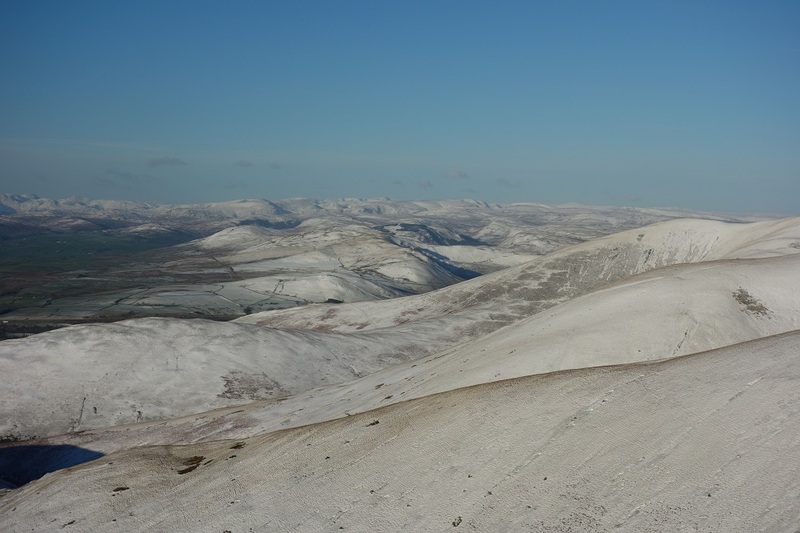 A jaunt over a few of the Howgill fells was a bit of a last minute decision, so last minute I forget to check the weather forecast, and also left that vital piece of hill wear at home…..a compass. That’ll teach me to be indecisive about which rucksack to use. 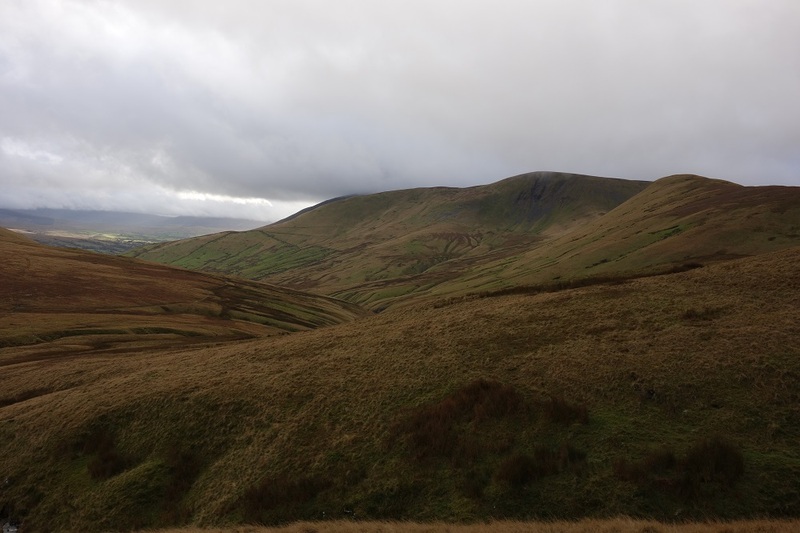 The first day was a simple low level ramble NE up the valley from Sedbergh past Cautley and on as far as Narthwaite. Warm, muddy and wet would about sum up this stretch. A mix of fields boggy from persistent November rain, farm tracks replete with lake sized puddles and farm yards inhabited by livestock that must have been force-fed Senokot. Giving my Tera’s a wash on Quick 30 the night before had been a waste of Percil. 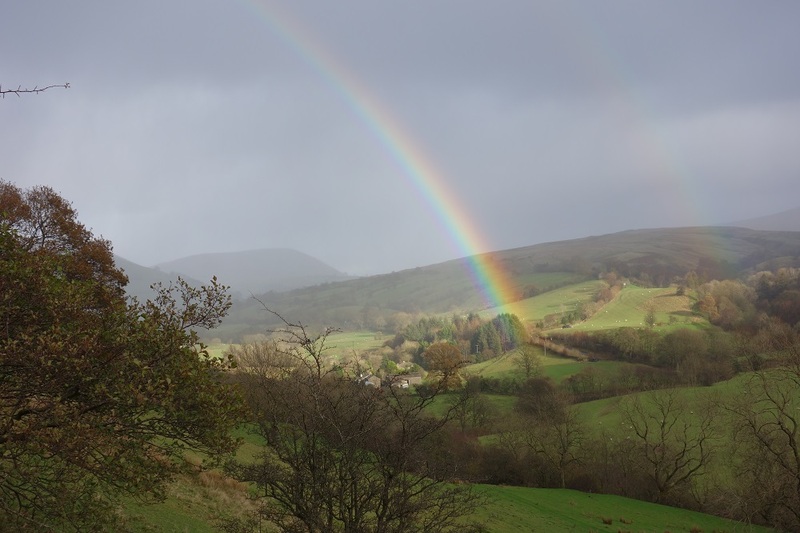 Still, there was the odd interlude when the sun poked through and cast an inviting rainbow over the route ahead. After a couple of hours of frustrating rain which couldn’t make it’s mind up whether to stay or go, it finally came to a decision and threw it down. Hopping about under a tree trying in desperation to pull my overtrousers on, I did a textbook fosbury flop. One of the advantages of being a Billy No Mates is that nobodies ever around to record these moments. After an calf deep crossing of Backside Beck I left the valley by the farm at Narthwaite and started the steady climb up past the farm buildings at Mountain View and on up to Green Bell on the tops. So far it had been pretty warm for a November day, and thankfully the rain had stopped on the way up. Though looking at the tops as I neared them it looked like the cloud was descending pretty quickly from the north. 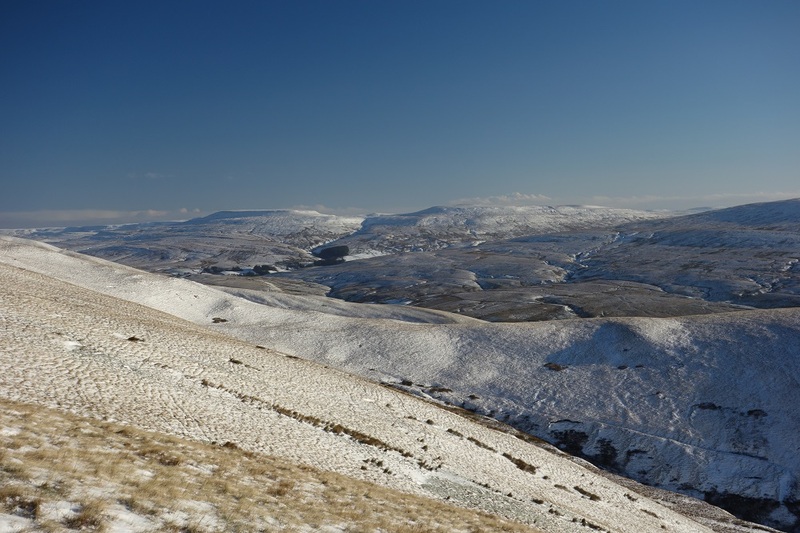 Once you get up on any of the Howgill tops the going is pretty easy. The hills just roll on from one another. After Green hill, Randygill Top gets ticked off easily across boggy windswept ground, then it’s a short down and up to bag Kensgriff. After a very steep descent to a saddle you’re then faced with a stiff but short scramble up the side of Yarlside, but while I was standing at the saddle having a peperami stick the weather changed in an instant. One minute all calm, then suddenly very windy and after a couple of minutes the wind was joined by icy snow flurries. The temperature plummeted and for a minute I must admit to peering through the blizzard at the clamber up Yarlside and wondering whether to just head back down to Narthwaite to camp, especially on account my lack of compass. 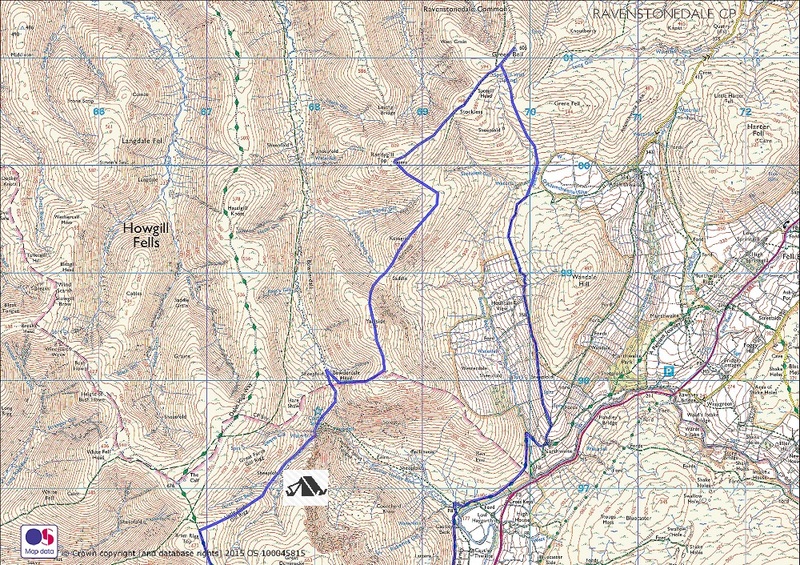 But with the planned camp spot at Bowderdale Head only a km further over the next top I decided to head on blindly and hope instinct would stop me wandering off course. As it was when I reached Bowderdale around 4:30pm what I’d hoped would be a half decent spot for the night proved to be nothing of the sort. I tried several spots over the next quarter of an hour, poking pegs here and there and never managed to get a single one in more than a couple of inches. The whole area was underlain with rocks just below the surface. Time was getting on and it was beginning to get dark so I scooted over towards Cautley Spout with fine snow still falling. One possibility was descending down to some sheepfiolds in Cautley Holme Beck but from up above it looked quite flooded down there. So I took a risk in the failing light and took a sheep track skirting around to meet a path above the Cautley Spout waterfalls. I’d like to say they were impressive falls, but I could just about see my own feet by that point so all I can say is they sounded impressive. 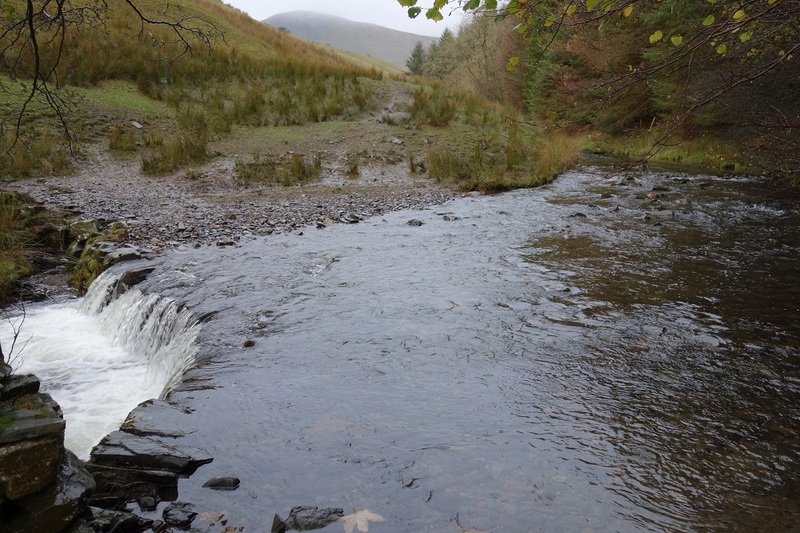 Thankfully a few hundred meters along the beck above the falls there’s a sheepfold with a descent patch of flat in front of it. I quickly set up my cuben Duomid, back to the wind, climbed inside and settled in for the night. I didn’t really care at this point that one of the tent corners was pegged into ground was so soft that pegs simply disappeared into it. It was getting cold, and it was dark. While I was packing some evening calories down me the wind started to change direction and by late evening it had swung around 180 degrees and wet weather from the SW gave way to a biting strong wind from the North carrying icy snow. The first peg gave way around midnight on the front corner leaving the vestibule flapping violently. I launched myself out of the door into a blizzard not even bothering to dress, putting my bare feet into boots full of spindrift. The peg had vanished, catapulted out of sight. So I grabbed one from the rear tie out to use. The ground was hopelessly ripped up though so I grabbed another from a side tie-out and double pegged the corner back down. Grabbing my spare pegs from inside I secured the rest of the tie outs back down and then checked the wind speed. Gusting 60-65 mph. Funny how when you rush out into a freezing wind you don’t feel so cold, but as soon as you’re back in the tent you start shivering uncontrollably. An hour later the other corner of the vestibule flipped it’s peg as the wind battered the tent front-on. At 3am the same happened again, but both vestibule corners. So out I go again, searching around for pegs which have been catapulted into the darkness. And by now I’m running out of spares and the ground on windward corners is so broken up that I’ve have needed a fence stakes to secure them. I’d also forgotten to bring my usual blizzard stake (AKA toilet trowel). With windspeed now gusting 70 mph I crawled back inside and weighed up my options. I had a tent barely staying up in the ferocious wind, but it was dark and bailing out wasn’t a good idea at that time. One route crossed very steep ground across the top of Cautley Sprout falls in the blackness, and the other went north over the tops head on into the wind. I packed everything except my sleeping bag ready for a bail out, put on all my spare clothes and huddled back down and waited for the sun to come up. When the first signs of light finally came I realised that in the panic I’d made a school boy error with my boots. and left them near the vestibule entrance. They were now completely frozen from the wind; leather, laces, tongues…the whole lot. I managed to squeeze then on and fold the laces as best I could out of the way. I wasn’t going to mess about with a stove trying to defrost laces, I just wanted to get walking, warm up and hopefully the heat from my feet would soften the boots. So of I trudged off into a winter wilderness. Beautiful it was, a fine dusting of icy snow over rolling hills , a clear blue sky and some warming rays from the rising sun. I’d been tempted to just head straight back down, but instead headed up Little Force Gill Rigg to Bram Rigg to enjoy the morning and warm up. And I’m glad I did, it was a wonderful walk over Calders and down Rowantree Grains. Totally still by now, not a whisper of wind after the express train of a north wind that had driven through the tent overnight. To the west the Lakes looked very inviting, as did Wild Boar Fell and Mallerstang to the East. Everything looking so much different to the day before. A change of seasons literally overnight. My boot laces however didn’t thaw, and in sheer numptyness I forgot about the spare pair in my tranklements bag. 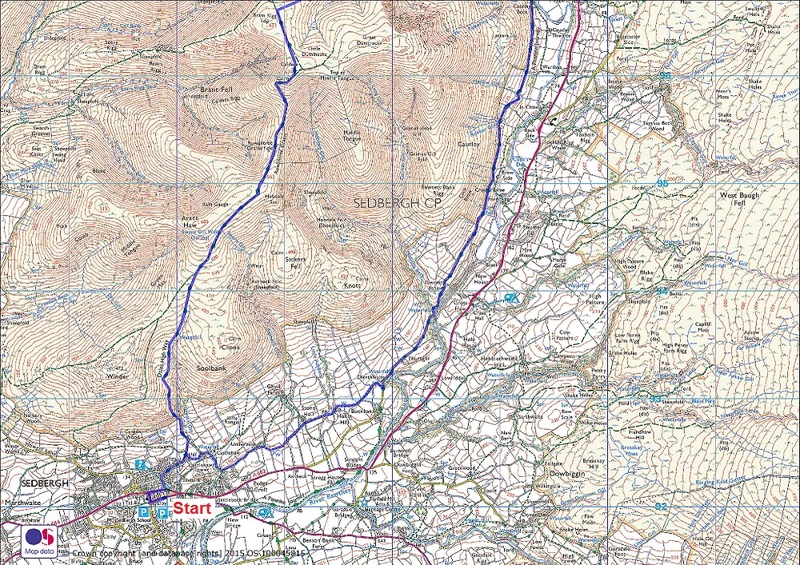 So I shortened the walk and descended back to Sedbergh off Arant Haw and down Settlebeck Gill past the waterfalls. All very pleasant. Back down at the car and warming up nicely with a cup of tea from a café, I was left to ponder on how many things I could get wrong in a single short walk. In a single overnighter I managed to forget my compass, fall over putting my overtrousers on, loose four tent pegs, forget to take a blizzard stake and leave my boots out to freeze overnight. Oh and to make matters worse I’d also forgotten to refill my hipflask before setting out ! One positive to come from my night in the Duomid in high winds was that my latest modification to the pole set-up came through with flying colours. The pole joint didn’t budge an inch under the strain and the damper worked well. Now if only I can find some way of taking some of the strain out of the corner tie outs I may a have a cuben tent I trust in high wind. Then again with the way my mind was working on this walk I’d probably forget the pole joint next time. Lovely walk though, I’ll be heading back there again. Footnote : All the tent pegs I used (and lost) were MSR Groundhogs. Most of the fault with pegs ripping out was in hindsight probably due to poor ground (very soft peat). 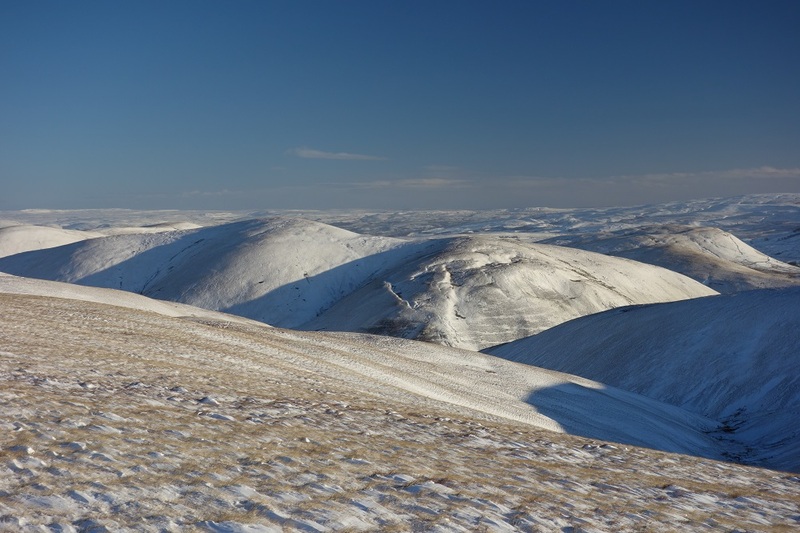 That was possibly the weekend we planned to go to the Howgills, but stayed on Kinder instead after seeing the forecast…..we had lots of snow too though! It was, I remember seeing your photos. It was a single days blast of winter before all the rain settled in for a month. Where there is soft ground, I look for rocks or other heavy objects to hold the peg (and hopefully the tent) down. After that, as you have indicated, having a few spares is always useful. It’s been an odd experience with the Cuben Duomid, in fact the only time I’ve time I’ve experienced problems with a tent in extreme weather, especially with pegs. I grew up with Phoenix tents (shows my age) which were almost glued to the floor by a copious number of guy-lines. In fact I spent three days once holed up in a Phoenix Phreerunner in a storm in Tiera del Fuego, southern Patagonia, back in the 80’s. By the second day a TNF Bullfrog and a TNF Tadpole had been totally shredded, and by day three mine was the only tent still standing. Back then my pegs were simple 6″ V-pegs and some skewers. I’ve also sat out some horrific weather while climbing routes on Denali without incident. I place a lot of faith in peg placement, but also some in how much a tent is allowed to absorb wind energy without transferring it to the pegs holding the structure down. And I think that’s where cuben may have a small problem. There’s absolutely no give in the fabric, so no wind energy is absorbed and it all gets transferred to the peg placements. I’m finding that peg choice and placement with a cuben fibre tent is far more critical than with sil-nylon or pu-nylon. 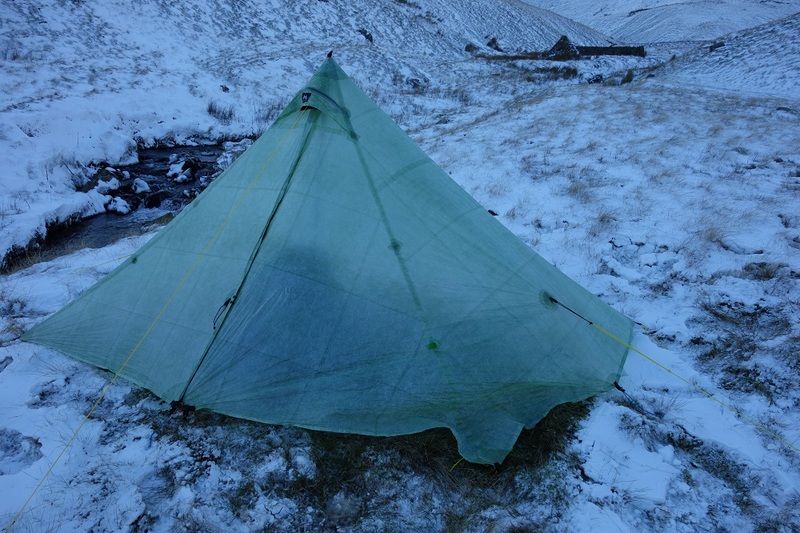 It’s been a big change in top end tents recently, from fabrics with a degree of give, held down by bungee loops and guys….to stiff cuben held down by short lengths of static dyneema line. I would agree about silnylon and “give” whilst not necessarily in your league of experiences I have never found that a Silnylon shelter gives way which is the reason why for really exposed conditions I would prefer to have a silnylon shelter. Cuben shelters definitely put a lot more strain on pegs because of the lack of give in the fabric. Pyramid shelters are also demanding. You might want to try an A frame on the Duomid. The MYOG A frame I’ve used on the Tramplite is superbly solid. I’ve also been able to vary the geometry to fit the Duomid by shortening the base line. I’ve not tried it yet, but with my Leki Sherpa XL poles the frame seems very solid. I reckon I will always take four MSR Blizzard stakes from now on with my Duomid, just in case. If the four corners are solid, it should be ok.
I’m going to tinker a while longer and test again when we get some wild weather. If all else fails I may consider replacing it with a Locus Gear Hapi in sil. Slightly lower than a Duomid so easier to use with an A’pole set-up, also has the small benefit of having the entrance on the shorter side which I prefer. Downside is Locus Gear look to use a more lightweight silnylon than MLD, which I wouldn’t eagerly choose for a winter set-up. 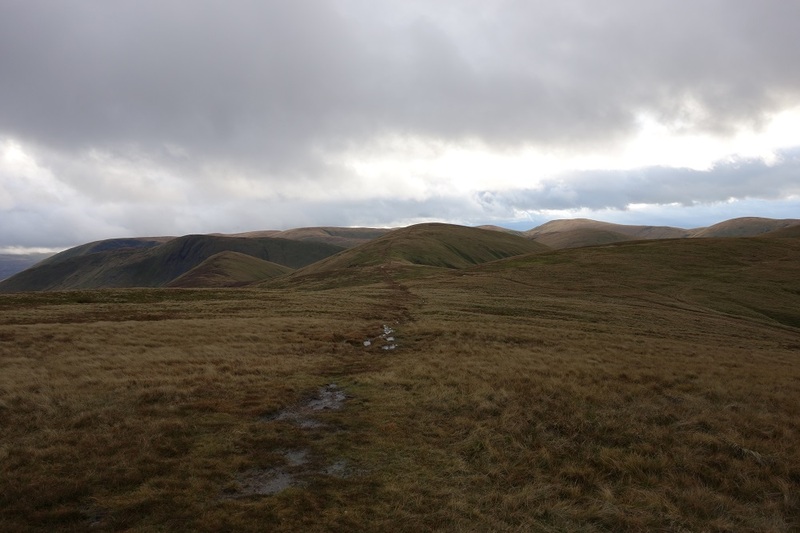 My first Howgill’s camp was terrible weather. James Boulter thought it was the worst night he had camped out in at the time. 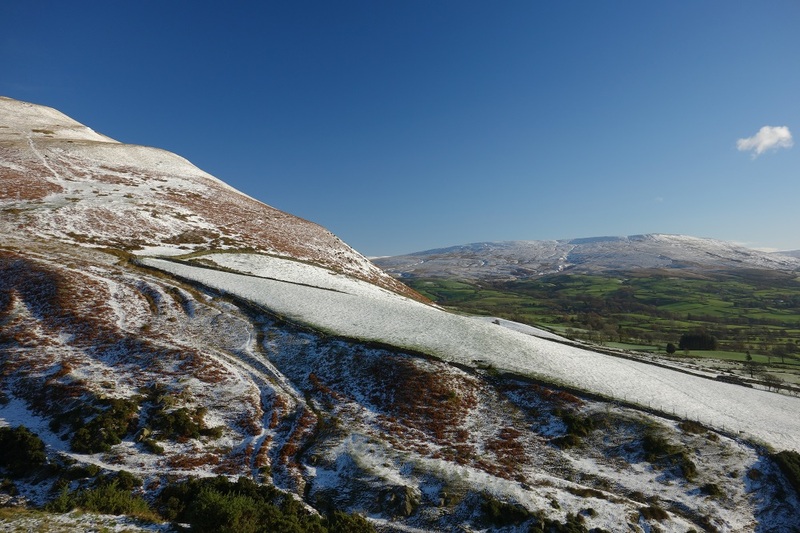 We had a wet horrid dawn – you had a massive expansive winter wonderland on show. Not so bad was it. It was a wonderful morning to wake up to Martin. As said , in the midst of the wind I’d been tempted just to head out, but by dawn it was a whole different story, and eerily still. Beautiful mornings walk over the top. How do you arrange your double pegs? I carry a couple of titanium nails for rocky ground and a couple of wide vee pegs for peaty ground so I can always get the windward guys pegged down. My other pegs are standard 6 gram titanium wires and I take a few extra of these. The guys sometimes try to lift off the nails so I use the spare wire pegs to fasten down the cord in the top of the nails. I line the two pegs up with the seam on the shelter, with the nail on the inside. It hasn’t failed so far with an admittedly silnylon Trailstar but I’m a summer camping wimp these days. I once suffered peg pull after rigging a washing line inside the Trailstar. I decided that the washing line was hardening up the seams of the Trailstar. After it had been taken down, the pegs stopped pulling even though they were in a mix of gravel and moss. As you indicate, a structure which deforms gracefully in gusts is much more likely to keep pegs in the ground. BTW, going back a few years, my Phoenix Phantom was once smashed down so fiercely that I thought its A pole had broken my nose. In the end, the wind will win. It depends what I have to hand John, the ground, and where on the tent the offending tie out is (ground level or guy-line). I carry a couple of short lengths of spare cord so sometimes I’ll add another line to the offending tie out on the tent itself, and peg the two lines out in a ‘V’ instead of in line with the seam. Back in the day, they actually used to sell triangles of fabric just for this purpose. One corner of the triangle clipped into the guy/tie out, leaving two corners to peg out. Occasionally I’ll peg out further out from the weak peg and leapfrog one onto the other in sequence (i.e. tie a short line into the leash on the first peg, and peg that out a foot or so back). I’ve had a tent fail on me catastrophically once too; we slept under a collapsed pile of wildly thrashing fabric and woke in a freezing puddle of water. Read this with keen interest,I wandered why you did”nt thread your guy line through the loops on your msr pegs with a harness hitch at least you would not loose your pegs. Not sure I can visualise that one Rich. Do you mean what I refer to as an Alpine Butterfly ? 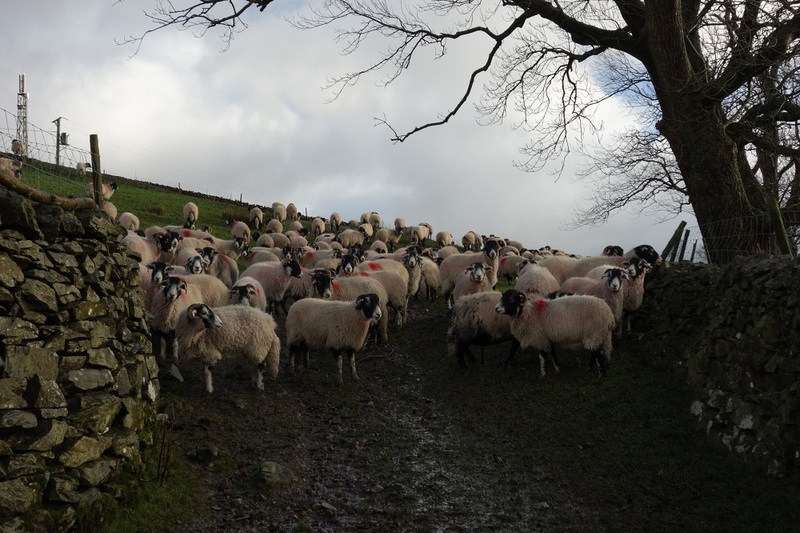 Had I arrived there in the light of day, as a good scout should have done, then I would have noticed the beautifully constructed, high walled, sheltered sheep fold only 50 meters on. Sticks out like a sore thumb in the photo, chastising me for my poor choice of pitch. 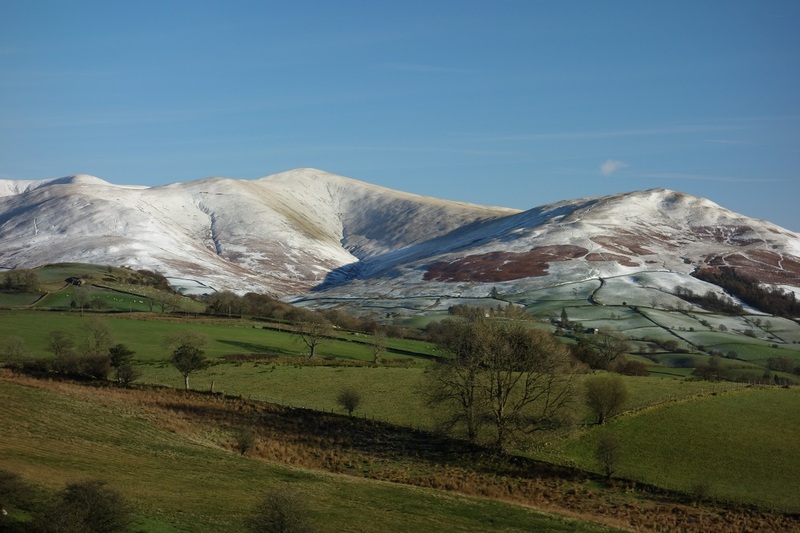 By the way, in the Howgills, adding a bit of give into the pole worked a treat. It didn’t slip an inch, just absorbed the gusts. Now all I need is to carry a few blizzard pegs and it’s sorted.